Objective: Synergistic effect between commonly used antibiotics against nosocomial multidrug-resistant strains of Staphylococcus aureus, if present, could provide a viable option as an alternative therapy for infections due to this pathogen. The aim of this study was searching for any synergistic effect between several antibiotics against drug-resistant strains of S. aureus with nosocomial origin using double-disk synergy test and to determine the applicability of this test for such a purpose. Methods: Over a 6-month period, strains of S. aureus isolated from clinical specimens of hospitalized patients with documented nosocomial infection underwent disk diffusion test using antibiotic disks of oxacillin, cephalothin, clindamycin, ciprofloxacin, vancomycin, cotrimoxazole, rifampin, erythromycin, gentamicin and meropenem. Double-disk synergy test was performed for all isolates resistant to at least two of applied antibiotics. Combinations of all possible pairs of antibiotics (to which the microorganism was resistant) were tested by placing antibiotic disks at distance of 20 mm from each other (center to center). After 16- 20 hours of incubation, if synergistic effect was present among two antibiotics, an inhibition zone was formed between their disks. Findings: Among all of possible two-antibiotic combinations tested for 41 resistant isolates, only two cases of synergistic effect were detected; both effects were among rifampin and cotrimoxazole. Conclusion: The combination of rifampin and cotrimoxazole could provide a viable option for treatment of infections due to resistant strains of S. aureus; however, clinical trials are needed before any new recommendation. Also, double-disk synergy test seems to be capable of detecting the synergistic effect between antibiotics at in vitro level. Today, Staphylococcus aureus is a frequently isolated pathogen causing serious invasive infections such as soft tissue infections, endocarditis, osteomyelitis, bacteremia, septic arthritis, and nosocomial pneumonia. Available treatment options for serious invasive diseases due to S. aureus are limited because of increasing antimicrobial resistance. In recent years, many isolates of S. aureus have evolved resistance to both synthetic and traditional antimicrobial chemotherapy. Of particular concern is the increasing frequency of methicillin-resistant S. aureus (MRSA). Recent surveys of S. aureus isolates report MRSA rates in the United States as high as 50%. The rates of MRSA are higher in patients in the intensive care unit and in those with nosocomial infections (often >60%). , Although vancomycin is considered by many to be the mainstay for the treatment of invasive infections caused by multidrug-resistant S. aureus, treatment outcomes in serious infections other than skin and skin structure infections (such as nosocomial pneumonia, endocarditis, and meningitis) are less than optimal. On the other hand, there are some reports of reduced susceptibility of S. aureus strains to vancomycin. ,,,,,,, Therefore, the need to new treatment alternatives is obvious. A number of methods used to detect in vitro synergy between antibiotics have been described; although the checkerboard and time-kill curve methods are the most widely used techniques, these methods are time-consuming. Also, the E-test method, a newer and easier technique, has availability and cost problems. In the present study, we searched for any synergistic effect between several antibiotics against drug-resistant strains of S. aureus with nosocomial origin using double-disk synergy test, a method routinely used for detection of extended-spectrum b -lactamase production by Enterobacteriaceae. This was a prospective cross-sectional study performed at Imam Khomeyni Hospital of Tehran, Iran, a 1400-bed referral teaching hospital. Over a 6-month period (from October 2009 to March 2010), disk diffusion test was done for strains of S. aureus isolated from clinical specimens of hospitalized patients with documented nosocomial infection, according to CLSI (Clinical and Laboratory Standards Institute) guidelines. The applied antibiotic disks (Padtanteb, Iran) included oxacillin, cephalothin, clindamycin, ciprofloxacin, vancomycin, cotrimoxazole, rifampin, erythromycin, gentamicin, chloramphenicol, and meropenem. S. aureus ATCC 25923 was used for quality control of disk-diffusion testing. After interpretation of the results using the CLSI breakpoints,  double-disk synergy test was performed for all isolates resistant to at least two of applied antibiotics to determine the effect of inactive agents against the resistant microorganism in combination with each other. Mueller-Hinton agar (Merck, Germany) was inoculated with saline suspension of fresh culture of isolated microorganism adjusted to 0.5 McFarland turbidity standard. Combinations of all possible pairs of antibiotics (to which the microorganism was resistant) were tested by placing antibiotic disks at distance of 20 mm from each other (center to center). After 16-20 hours of incubation, if synergistic effect was present among two antibiotics, an inhibition zone was formed between their disks. Over the study period, of 77 patients with a type of nosocomial infection whose clinical specimens yielded S. aureus, 41 patients had isolates resistant to at least two antibiotics (determined by disk diffusion test) that underwent double-disk synergy test. Twenty-six patients (63.4%) were male. The mean ΁ SD of age for these patients was 34.6 ΁ 20.0 years. [Table 1] shows the frequency of detected nosocomial infections. As shown, surgical site infection and pneumonia were the most frequent infections (both 29.3%) due to these resistant strains. Accordingly, from 41 clinical specimens (6 types), wound secretions and tracheal secretions were the most frequent ones (34.1% and 26.8%, respectively) followed by blood (22%), venous catheter tip (9.8%), shunt/drainage tube tip (4.9%), and sputum (2.4%). 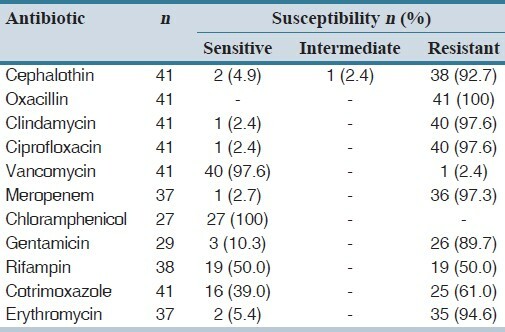 [Table 2] shows the susceptibility pattern of isolated nosocomial S. aureus strains determined by disk diffusion test. As shown, all isolates were sensitive to chloramphenicol. Also, with the exception of one strain, others were susceptible to vancomycin (97.6%). In contrast, susceptibility of this microorganism to other used antibiotics including cephalothin, oxacillin, clindamycin and ciprofloxacin was low. Of all possible two-antibiotic combinations tested for isolates, only two cases of synergistic effect were detected; both effects were among rifampin and cotrimoxazole. Both isolates had been obtained from tracheal secretions of two patients with documented ventilator-associated pneumonia (VAP) at hospital's intensive care unit (ICU). These two isolates were resistant to all used antibiotics (including rifampin and cotrimoxazole), except for vancomycin and chloramphenicol. In our study, the results of double-disk synergy test showed synergistic effect between rifampin and cotrimoxazole against two strains of multidrug-resistant S. aureus. We found only one report of such an effect in vitro by double-disk synergy test presented by Gosbell;  however, in his study, the evaluated MRSA strains had two differences with our isolates: First, they were all community-acquired strains (CA- MRSA) and second, the isolates were not multidrug-resistant strains but only resistant to penicillin and oxacillin. Therefore, our finding is of important value which shows that the combination of rifampin and cotrimoxazole could be considered for treatment of infections due to multidrug-resistant S. aureus after confirmation of their synergism by double-disk synergy test. In contrast to our finding, in the study of Kaka et al., adding rifampin to cotrimoxazole showed a trend toward antagonism in vitro;  also, in the study of Harvey et al., the rifampin-trimethoprim-sulfamethoxazole combination was antagonistic in vitro against S. aureus. Therefore, the efficacy of such antibiotic combinations should be evaluated in clinical trials. In the study of Jemni et al., all eight patients treated by the combination of cotrimoxazole and rifampin for treatment of infections due to MRSA were cured. Considering increased rate of resistance among S. aureus strains, it is urgent for the worldwide medical community to reexamine the clinical efficacy of older active therapies, such as cotrimoxazole, for treating severe infections due to these pathogens. The synergism between rifampin and cotrimoxazole against resistant strains of S. aureus could provide a viable option for treatment of infections due to these resistant microorganisms; however, any new recommendation on the use of this combination should be based on strong evidence rather than sporadic case reports or in vitro studies. Also, double-disk synergy test seems to be capable of detecting the synergistic effect between antibiotics at in vitro level. We recommend implementation of this test as a routine antimicrobial susceptibility test in the hospitals' microbiology laboratories, at least for antibiotic-resistant microorganisms. This study was supported by a grant from Office of Vice-Chancellor for Research of Tehran University of Medical Sciences. 1. Daum RS, Seal JB. Evolving antimicrobial chemotherapy for Staphylococcus aureus infections: Our backs to the wall. Crit Care Med 2000;29:92-6. 2. Sader HS, Biedenbach DJ, Fedler KA, Fritsche TR, Jones RN. Frequency of occurrence and antimicrobial susceptibility of bacterial isolates causing bloodstream infections worldwide: Report from 8 years of the SENTRY antimicrobial surveillance program (1997-2004) [abstr]. In: Program and abstracts of the 45 th interscience conference on antimicrobial agents and chemotherapy. Washington, DC: American Society for Microbiology; 2005. 3. Salgado CD, Farr BM, Calfee DP. Community-acquired methicillin-resistant Staphylococcus aureus: A meta-analysis of prevalence and risk factors. Clin Infect Dis 2003;36:131-9. 4. Wisplinghoff H, Bischoff T, Tallent SM, Seifert H, Wenzel RP, Edmond MB. Nosocomial bloodstream infections in US hospitals: Analysis of 24,179 cases from a prospective nationwide surveillance study. Clin Infect Dis 2004;39:309-17. 5. Drew RH. Emerging options for treatment of invasive, multidrug-resistant Staphylococcus aureus infections. Pharmacotherapy 2007;27:227-9. 6. Centers for Disease Control and Prevention. Reduced susceptibility of Staphylococcus aureus to vancomycin-Japan, 1996. MMWR Morb Mortal Wkly Rep 1997;46:624-6. 7. Hiramatsu K, Hanaki H, Ino T, Yabuta K, Oguri T, Tenover FC. Methicillin-resistant Staphylococcus aureus clinical strain with reduced vancomycin susceptibility. J Antimicrob Chemother 1997;40:135-6. 8. Turco TF, Melko GP, Williams JR. Vancomycin intermediate-resistant Staphylococcus aureus. Ann Pharmacother 1998;32:758-60. 9. Centers for Disease Control and Prevention. Staphylococcus aureus resistant to vancomycin-United States, 2002. MMWR Morb Mortal Wkly Rep 2002;51:565-7. 10. Centers for Disease Control and Prevention. Public health dispatch: Vancomycin resistant Staphylococcus aureus-Pennsylvania, 2002. MMWR Morb Mortal Wkly Rep 2002;51:902. 11. Quirk M. First VRSA isolate identified in USA. Lancet Infect Dis 2002;2:510. 12. Tenover FC, Weigel LM, Appelbaum PC, McDougal LK, Chaitram J, McAllister S, et al. Vancomycin-resistant Staphylococcus aureus isolate from a patient in Pennsylvania. Antimicrob Agents Chemother 2004;48:275-80. 13. Centers for Disease Control and Prevention. Vancomycin-resistant Staphylococcus aureus-New York, 2004. MMWR Morb Mortal Wkly Rep 2004;53:322-3. 14. Clinical and Laboratory Standards Institute, Performance standard for antimicrobial susceptibility testing 2009. CLSI document M100-S19. 29 (3). CLSI, Wayne, PA.
15. Gosbell IB. Time-kill and disk synergy studies with non-beta-lactams against non-multiresistant methicillin-resistant Staphylococcus aureus. Pathology 2006;38:259-61. 16. Kaka AS, Rueda AM, Shelburne SA III, Hulten K, Hamill RJ, Musher DM. Bactericidal activity of orally available agents against methicillin-resistant Staphylococcus aureus. J Antimicrob Chemother 2006;58:680-3. 17. Harvey RJ. Antagonistic interaction of rifampicin and trimethoprim. J Antimicrob Chemother 1978;4:315-27. 18. Jemni L, Hmouda H, Letaief A. Efficacy of trimethoprim/sulfamethoxazole against clinical isolates of methicillin-resistant Staphylococcus aureus: A report from Tunisia. Clin Infect Dis 1994;19:202-3.